I’ve been asked a few questions about the Plug-in Spy (ALT+SHIFT+F1) but haven’t had time to reply, but now I do so here’s my chance. Does the Plug-in Spy work in RCP? Does the Plug-in Spy work in Eclipse 3.3? It should, it doesn’t depend on anything from the 3.4 code base. I’d just build your own copy of the spy from HEAD and export it using the PDE wizards. 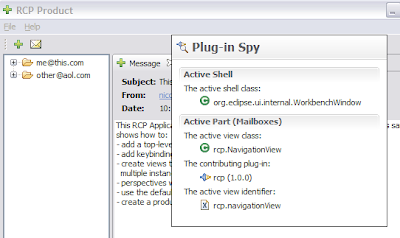 Does the Plug-in Spy work in Eclipse 3.2? No, it takes advantage of some things found in the Platform Command Framework which made its debut in the 3.3 version of Eclipse. In theory the spy could work in 3.2, but it would require a rewrite and that’s something I’m not interested or have time for right now. There are bigger fish to fry in PDE at the moment to make plug-in development truly a first-class experience.